Hidd Power Company (HPC) is an independent power and water company providing Bahrain with reliable power and potable water supplies 24/7. HPC’s plant has power and water installed capacity of 992 MW and 90 million imperial gallon per day (MIGD) respectively based on a 20-year Power and Water Purchase Agreement (PWPA) with the Electricity and Water Authority of Bahrain (EWA). "HPC is a major contributor to the growth of the kingdom. Our brand-driven company is meeting the increasing power and water demands of the kingdom and currently provides approximately 30 per cent and 55 per cent of the total power and water requirements respectively for Bahrain," says a company spokesman. The company is privileged to have the support and access to the experience of three major international companies –Malakoff Corporation, Sumitomo Corporation and Engie, he says. HPC’s power generation and desalination facilities have been constructed in three phases. 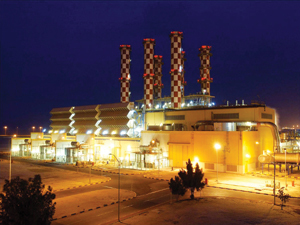 Phase 1 comprises two Alstom 13E2 gas turbine units with a total power capacity of 272 MW with associated heat recovery steam generators (HRSG) producing electricity and heat for four multi-stage flash (MSF) desalination units producing 5,682 cu m/hr or 30 MIGD of desalinated water with each unit rated to 7.5 MIGD. Phase 2 comprises three Alstom 13E2 gas turbine units with three HRSG and a steam turbine (ST) unit with total power capacity of 720 MW, which have the capability of supplying heat to the Phase 3 desalination plant, he says. Phase 3 provides ten multi-effect distillation (MED) units capable of producing 11,365 cu m/hr or 60 MIGD of desalinated water with each unit rated to 6 MIGD. The product distillates from Phase 1 and Phase 3 desalination units are directed to the re-mineralisation plant and disinfection system before the water is delivered into EWA storage tanks. The HPC plant has received ISO 14001 and ISO 18001 certifications. HPC has excellent safety standard and records. It has been awarded with the UK RoSPA Health and Safety Gold Award for the past three consecutive years, he adds.